e-forlaget™ means literally "The e-Publishing House"
We publish cute computer programs and odd electronic music! All programs and music available from our site are protected by copyright, but free of charge ("freeware"). SecretMessage is a program for friends and lovers and others interested in writing secret messages to one another. The program both encrypts and decrypts text messages with an advanced key in real time, and you may also protect your message with a password of your choice. 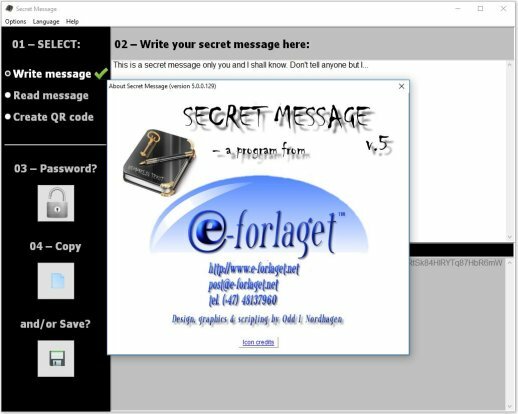 Only a receiver with SecretMessage installed on his/her computer is able to read your message, and only if he or she knows the optional password. On top of that, the program file itself can be protected by password, so you may rest asure your private messages remain private. SecretMessage may even create QR codes of short texts (for instance internet addresses) and phone numbers. QR is short for Quick Response, the square black and white patterns that especially smart cell phones may scan and save and use. Our QR codes are made with the program. The program is published in both English and Norwegian. On initial startup you may select your preferred language. Only if you want to save your preferred language, the text file magic.ini is created. The program is yours, to have and to hold, but protected by copyright. Although in Norwegian only, the numbers and mathematics are international, so we encourage you to try out minneKalkulator, translated "memoryCalc(ulator)". 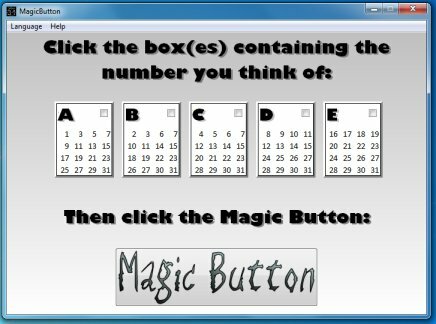 It is a small Windows calculator with all basic functions and with extended memory. You may save up to 5 formulas with the MS button to be re-used later with the MR button. If you need to store even more formulas or results, you will first have to delete at least one formula with the MC button. 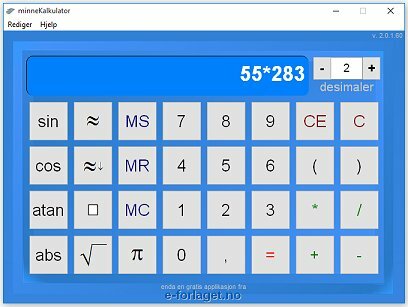 In addition to the four elementary, mathematical operations of aritmethic (addition, subtraction, multiplication and division), the memoryCalculator also have easy ways of submitting (pi) and 2(pi). You may also calculate sine, cosine and arc tangent, and use absolute value to remove negatives. You may round results to the nearest number or truncate to the nearest digit and calculate squares and square roots. You may even decide the numbers of decimals in (pi) and results. By right clicking the function buttons, that function will be put directly into the formula. By right clicking a parenthesis button, you may enclose the formula in parenthesis. The menu item "Rediger" translates to Edit and has a copy and paste function. Sorry to say, also the help file is in Norwegian only. Our award winning shareware computer game Spell-IT is no longer downloadable, sold or supported. New versions of Spell-IT are available in Norwegian only ("Finn ordet"). We apologize for any inconvenience. 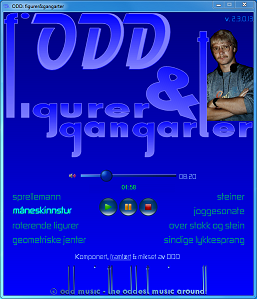 e-forlaget™ is an ODD Music publisher, both online and as downloadable computer programs. ODD can also be found as an artist on Discogs, including several unofficial releases. What I want to achieve with my music, is to describe the beauty I experience during my days on earth, the undescribable mystery of our being. This is intense, and the expressions will have to comply with the impressions. Because beauty really is beyond description, at least I try to indicate and touch it, give associations to the real thing and hopefully reach the same strings and feelings in other souls. What I want, is to give kindred spirits hints of my own joy, my own sadness, a fantastic life adventure! With these fundamentals, the musical result may be private and personal, maybe important and effective for me alone. This potential danger worries me only through my need to share my life experience with people I know and love, and others interested. The main reason is to convince myself of a true and genuine essence in the music I create. Such contemplation of my own navel is the opposite of cynical egotism in my experience. The maturation of my personality through arts is a condition to function satisfactorily socially and within myself. I am more fascinated with rhythm patterns than melody lines. My music bears obvious evidence of this attitude. Even though a melody is better capable of instant beauty recognition, a sequencer pattern can plough deeper into the listening soul, through the seeming monotony and the almost transparent changes in modulation, tempo and timbre. When listening to my odd music with an open mind, you may find or co-create mental landscapes and colors or dream dramatic scenes inside your spirit, even when awake. Enjoy! 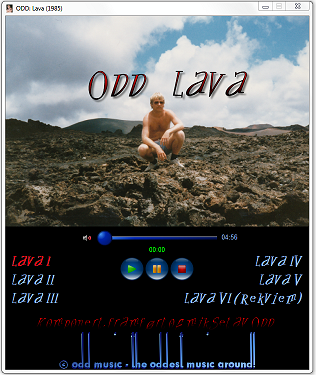 In 1985 ODD produced the cassette Lava with heavy, teutonic rythms - melancholic and meditative sound travels in a rough and unknown lava landscape, inspired by his first journey to the Lanzarote island that summer. The downloadable file is about 36 MB, with a total play time of about 37 minutes. All titles composed/improvised, performed and mixed by ODD. The album is available online. Enjoy! figurer&gangarter (Figures & Ways of Walking) is a selection of improvised soundscapes from a time long gone, performed on analogue synthesizers in 1985 and 1986. Version 2.3 consists of 8 formerly unpublished musical pieces representing the essence of ODD Music, both long tune travels with programmed development and shorter melodies, both calm meditations and faster rhythms, with a total play time of over 42 minutes. The downloadable file is 60 MB. The album is available online, including a YouTube video. Enjoy! Sound Roses is exciting music. Originally released as a "cassette single" in 1986, it was the first time ever that Norwegian folklore music and synthesizer music were mixed and heard. 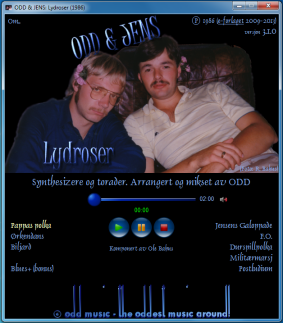 e-forlaget™ have re-published this unique musical experience as a "computer single", still under our very honest trademark: ODD MUSIC - the oddest music around!™. Daddy's Polka is composed by Ole Bahus, Desert Dance by Edgar Froese and Battle Cry of Freedom from 1862 by George F Root. Billiards and F.O. are composed by Odd. Other tunes are traditional folklore. 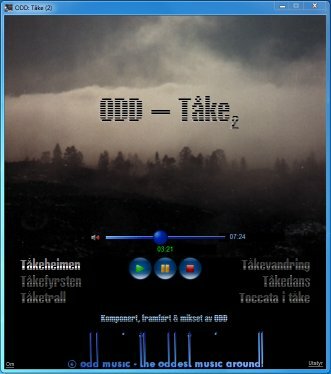 In 1987 ODD's cassette "Tåke" (Fog) was published by Piivv Cassettes (see Discogs). Our version 2 is a bit different. Some tracks are replaced with others, and the scores are given more descriptive titles which are difficult to translate from Norwegian. The downloadable file is over 55 MB, with a total play time of over 53 minutes. The album is available online. Enjoy! You may also listen to "Ricochet", a radio show broadcasted in Norwegian on November 30, 1985 on Bergen's local radio station. Mr Jarli only presented the ODD Music. Tåkefyrsten was then called Middelalder II (Middle Ages II), this musical journey's original title. Daddy's Polka (from the album Sound Roses) was played as an odd intro, and at the end of the program a short telephone interview with ODD was made on top of the longplay soundscape "Hydrosphere". The recording is about 40 minutes long. 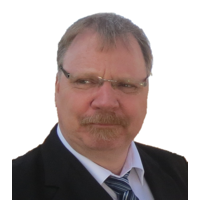 Odd L. Nordhagen is e-forlaget's editor, in-house author and programmer. He now works as an IT administrator in a well reputated real estate agency. e-forlaget™ is now a hobby project and no longer officially registered as a company in Norway. It all started in 1980 when Odd, still a teenager, made his debut with a collection of poems called "Homo sapiens" published by Kulturforlaget BRAK, wrote a self-published homage "Kransen sluttes" (Full wreath) to a friend killed in a car accident, and started publishing the magazine "Oasen" (Oasis). In 1984 Kulturinstitusjonen Piivv published his book of poems "Sakte, sikkert" (Slowly, surely) and his album "Tåke" (Fog) of electronic music in 1987.
e-forlaget™ was established in 2002. Our first literary publication was "Solvind" (Sunwind), containing more of Odds youth poems and also his innovation, the hyper poem (a poem with links to associated poems). Later we have re-published "Kransen sluttes", "Sakte, sikkert" og "Homo sapiens" as electronic books, with the original publishers' acknowledgment. Odd is also working on a book down memory lane to be published chapter by chapter, and as a direct result of this, we published the book "Adam in Paradise". Our ebooks are published in Norwegian only.